The Internet has created new ways for us to connect to each other and exchange ideas and information. This allows us to make much better use of all the talents, ideas, knowledge, creativity and manpower that are present in our society. Collectively we can be smarter. This is often referred to as the ‘wisdom of crowds’: under certain circumstances, a large group of individuals can take wise decisions and make good predictions. How can we harvest the wisdom of crowds with help of the internet and new technologies? What can we do with this and how are filter bubbles, fake news and social media destroying the wisdom of crowds. If we are able to harness this wisdom of crowds, our society can become happier, healthier and more sustainable. At the same time, these developments are also challenging: the distribution of power and ownership between citizens, communities and existing organizations and business models is shifting. What lies ahead of us when the Internet and social media penetrate our lives more and more and when even our surroundings become intelligent and sensible? Can artificial intelligence and the internet of things help mankind to become more collectively intelligent? And how can we use this intelligence and everybody’s participation to tackle complex problems such as a healthy lifestyle and clean environment. In the foresight study ‘Wisdom of the Crowd’ I explored the potential impact of the ‘wisdom of crowds’ on our society in 2030. Between 2009 and 2011 more than hundred experts in the field of ict, artificial intelligence, social sciences, artistst and industrial designers, public administration and business administration were involved in this collaborative process, managed by Maurits Kreijveld. Through workshops, interviews, reviews and essays people participated both offline and online. This resulted in three visions of the future, that illustrate how the ‘wisdom of crowds’ can make our society in 2030 healthier and more innovative and how citizens can work together and take decisions collectively in the smart cities of the future (cocreation and self organization). These future visions are described and visualized in the book ‘Samen slimmer. Hoe de wisdom of crowds onze samenleving zal veranderen’ (Collectively smarter. How the wisdom of crowds will change our society in English). The book was presented to the head of Dutch Parliament, Miss Gerdi Verbeet, during a conference in April 2012, on the future of democracy. Samen slimmer. 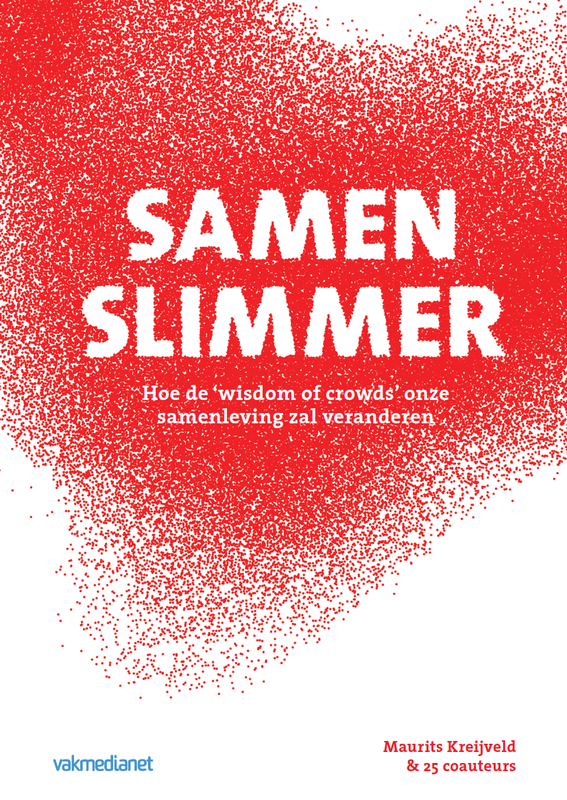 Hoe de wisdom of crowds onze samenleving zal veranderen (2012, 2014) [= Collectively smarter] about the wisdom of crowds and how this could make our society healthier, more innovative and more participatory in 2030. In the book you’ll find future visions of healthcare, innovation and the smart city.